Void Main wrote: I have upgraded two of my RH9 machines to Fedora. Have a few minor snags but it looks nice. One machine I upgraded remotely via apt-get (I created my own Fedora os apt repository) and the other I upgraded from CD. For some reason mozilla doesn't start using the /usr/bin/mozilla script but it does start if I run the binary directly (/usr/lib/mozilla-1.4.1/mozilla-bin). It's probably something simple but I literally just got this up on it's first boot not more than 5 minutes ago. Will give a more detailed report later. I might upgrade the web server next if things look like a go. Void, now that there are fedora repositories at freshrpm's & other places, can I just point my apt-get source file to a core 1 list & then just apt-get distro-upgrade? This is a working (well samba quit on me a couple of days ago) RH9. I need things like turtlefirewall & webmin to continue working, or should I just wait until a see a "specific" for fedora replacement rpm's before I updgrade? lovswr wrote: Void, now that there are fedora repositories at freshrpm's & other places, can I just point my apt-get source file to a core 1 list & then just apt-get distro-upgrade? This is a working (well samba quit on me a couple of days ago) RH9. I need things like turtlefirewall & webmin to continue working, or should I just wait until a see a "specific" for fedora replacement rpm's before I updgrade? Yes you can do it that way. Of course you'll need a high speed connection which I assume you have. Since I have more than one machine to upgrade I prefer to actually download the CDs and set up my own "core" repository localy so I don't have to use up FreshRPMS bandwidth several times over, and I can pump a copy out on CD and do a CD upgrade for that matter (both ways work equally well in my experience). I'm not sure about Turtle Firewall as I don't use it but I don't think iptables has changed any and it should still work. Webmin should work as well, but there is probably an updated version for Fedora out there already I would think. I haven't upgraded my firewall yet and I use Shorewall on it which I suspect will work just fine. I might upgrade that tonight. I can test Shorewall on my test box first to make sure it works. I suppose I could also test TurtleFirewall and Webmin on that for you as well. EDIT2: I have updated my firewall box using apt and am now in the process of updating my dns/dhcp/pdc machine via apt for a total of 4 machines that I have done via apt, one machine via CD text mode, and one machine via CD graphical mode. 1) On every system that I updated via "apt-get dist-upgrade" it should have replaced the "redhat-release" package with "fedora-release" package but it doesn't for some reason. No problem, after the "apt-get dist-upgrade" finishes just do an "apt-get install fedora-release" and it will do what needs to be done. If you fail to do this it will still say "Red Hat 9" at the login prompt and on bootup it will say something like "Starting Red Hat" instead of "Starting Fedora". 2) The other thing you'll want to do is "apt-get install kernel#2.4.22-1.2115.nptl" and set it to be the default kernel in /etc/grub.conf (default=0) before you reboot. The old kernel will still work so if you don't change the default it's no big deal. 3) For some reason instead of upgrading Sendmail, the new version gets installed without removing the old version so you have two copies. I had no problem just removing the old version by "rpm -e sendmail-8.12.8-9.90" and the new version was left untouched and working. I believe if you do the three things above then it shouldn't be much different than upgrading via CD. Well I thought Fedora had a problem with the nVidia drivers as X locked up a couple of times on me. I have a GeForce 2 card and I updated to the latest drivers at the same time I upgraded to Fedora. After thinking about it a while I remembered upgrading to the latest drivers a few months back and had the same problem under RH 8 and 9. I went back to the previous release of driver and now all is well. Must be some sort of problem with the new drivers and my old GF2 card. There is something you must do special in Fedora to install the drivers though. Make sure you type "export CC=gcc32" in the same shell you run the installer from and you should have no troubles at all. lovswr wrote: 2) The other thing you'll want to do is "apt-get install kernel#2.4.22-1.2115.nptl" and set it to be the default kernel in /etc/grub.conf (default=0) before you reboot. The old kernel will still work so if you don't change the default it's no big deal. do you also need to "apt-get install kernel-headers" and "apt-get install kernel-modules" or just keep the ones that are there? In Red Hat, the modules are part of the "kernel" RPM. Also the kernel headers are called "glibc-kernheaders" which were upgraded in automatically in the "apt-get dist-upgrade". It doesn't follow the kernel release version numbers exactly. For instance, the headers version that comes with Fedora is "glibc-kernheaders-2.4-8.36" and the kernel is "kernel-2.4.22-1.2115.nptl". So to answer your question everything related to the kernel will be upgraded except for the kernel itself (and it's included modules) on an "apt-get dist-upgrade". Even the kernel source package will be upgraded if you have it installed. The info you have provided in this thread Void is invaluable. Perhaps you should make it a sticky? (at least for a little while). Since my initial posting, I have read of some diffuculties with Fedora (check out OSNews), but with the information you have provided in this thread, I am feeling confident. Anyway, nothing ventured is nothing earned! Thanks, and I'll make it a sticky (if I can figure out how). :) I saw a few unfavorable reviews as well but it seems there are a lot of reviewers out there who really don't have clue one. Oh well, such is life. Now to expand on the issue of reviewers without clues. 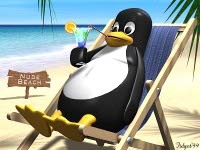 What really bugs me more than anything is most unfavorable reviews I have seen are because of trivial issues that the reviewer can not seem to overcome, yet if he/she had asked an experienced linux user in the community for help he/she would have found that there really was no issue at all. At least it may have been far more trivial than what the reviewer makes it out to be. I can't tell you how tired I am of seeing reviews written where they can not get a 3rd party RPM installed because of dependency problems, or try to install a 3rd party package from source that happens to be something that is way over their heads, and isn't even a part of the distribution they are reviewing... BUT the package in question exists in an apt repository and could have been installed with a single click in synaptic!!!!! Something the reviewer doesn't even understand exists or how to use. It's sad really. To me, it would be a MUCH more useful review if the reviewer were to try to do an install unassisted and when they run into problems they go to people who are more knowlegable and get answers to their problems. Then write the review, list the problems they ran in to, describe how they were able to overcome the problem and where they went for help. Linux is all about community and helping each other out. Use it! Need to get 0B/575MB of archives. After unpacking 170MB of additional disk space will be used. I changed /etc/apt/sources.list back to RH9 & dist-upgrade only offered 2000k (versus the 170MN when it's pointed at fedora) of upgrade so suspect that pointing to fedore is correct. But what am I doing wrong? Ooops, I forgot to mention that I also ran into that on at least one of my machines (maybe more), sorry! There are a couple of ways you can work through that issue. I believe the perl module in question (perl-CPAN) used to be a separate module where now it is part of the base Perl package and why it's causing a problem. You can either remove the module in question ("rpm -e perl-CPAN", might also need a --nodeps on that comand) prior to the dist-upgrade or you can force install Perl from your apt cache (rpm -Uvh /var/cache/apt/archives/perl*5.8.1*rpm --force). Then the "apt-get dist-upgrade" should sort out the differences and make everything right and also install properly including removing the unnecessary/redundant perl module. I think there are a couple of more perl modules that the same thing will happen with. You do not have those installed apparently. Last edited by Void Main on Sat Nov 15, 2003 8:17 am, edited 1 time in total. 700MB required, I am going to give it a shot. But not now, i'll do it overnight or when i have dinner because I need the internet today. Linux is like the ultimate tease. So close, yet so damn far So I'm burning the 3 cd images as I type. That's is how I have been doing it since RH7. That's weird, I run "gpg --fingerprint" and don't get any output at all. I am running gnupg-1.2.2-3 (stock). Also if I do a "rpm -qa gpg-pubkey*" I get no output. From what I can tell I have no keys at all installed so I am not verifying the signatures. What do you get when you do a "rpm -qa gpg-pubkey*"? You might also try adding the "--nosignature" option to your /etc/apt/apt.conf in the RPM "Install-Options" key. That would be a workaround but you seem to be having an unusual problem. I don't know enough about GPG and signatures to be sure where to look other than what is said in the man page, and or comparing with a stock installed system. Could it also be something in your /root/.gnupg/* config files? I believe I get that because I have never added the FreshRPMS signature, and if I add it I suspect that will go away. I'll try it right now. EDIT: I just downloaded and imported the FreshRPMS signature and all did was stop the gpg warning messages (which is a good thing, means the signatures matched). I would suggest try removing the existing signature and then downloading the known good signature and importing it "rpm --import RPM-GPG-KEY". See if that fixes it.